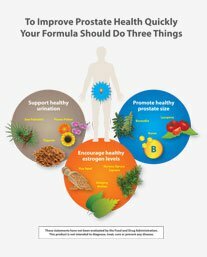 Advanced, multi-nutrient formula for prostate health! 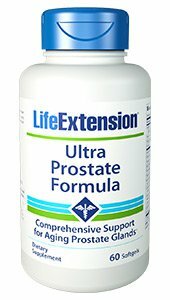 Ultra Prostate Formula: It’s essential for men to maintain prostate health as they age. Ultra Prostate Formula delivers a dozen complementary ingredients that support prostate cell health and healthy urination patterns, help inhibit excess estrogen, promote a healthy inflammatory response, and more. This is our most-advanced prostate health supplement – add it to your daily men’s health regimen today! Lycopene — An antioxidant carotenoid, lycopene promotes healthy prostate size and function. Graminex® Flower Pollen Extract™ — This concentrated pollen extract helps promote a healthy inflammation response and urinary comfort. Saw palmetto CO2 extract — This extract delivers a standardized dose of Serenoa repens, which supports healthy urinary flow and promotes a healthy inflammatory response. Prostate cells are sensitive to estrogen. And as men age, testosterone converts to estrogen at higher rates. So, we’ve included potent nutrients to help inhibit estrogen’s effects on prostate health. Flax seed and Norway spruce — This proprietary combination of standardised lignans from flax seed and Norway spruce knot wood convert to enterolactone once ingested. Enterolactone helps support healthy hormone metabolism and prostate function. AprèsFlex® is a registered trademark of Laila Nutraceuticals exclusively licensed to PL Thomas – Laila Nutra LLC. HMRlignan™ is a trademark used under sub license from Linnea S.A. Lyc-O-Mato® is a registered trademark of Lycored Corp. Albion® is a registered trademark of Albion Laboratories, Inc.